What milestones has the LCA’s journey recorded since inception? The LCA was formally launched in 2012. It received an endowment from the Investment Climate for Africa (ICF) in its support for judicial reform as well as the proliferation and benefits of ADR in Nigeria. In 2013, the focus of the LCA was centred on brand awareness and public enlightenment about ADR and its benefit to businesses. Public acceptance and support have been positive, as indicated in the growing and varied number of personalities on our membership roll. The LCA has hosted a number of knowledge and awareness workshops for the promotion of ADR. It held its first ADR conference in 2013, and on the same year, celebrated a milestone of being appointed the sole dispute service provider for the Lagos State Home Ownership Scheme Mortgage (Lagos HOMS). In 2014, the LCA intensified its ADR awareness workshops. In addition, the leadership of the LCA undertook study visits to the International Chamber of Commerce in Paris and arbitral insitutions based in New York City to observe their activities. Similarly, Board members of the LCA presented papers on ADR at various local and international events. The LCA relocated to its headquarters—the International Centre for Arbitration ADR (ICAA), Lekki, Lagos in 2015. The ICAA is the first purpose-built ADR centre in Africa, equipped with the latest facilities to support arbitral hearings and other corporate events. Advancing in its strides, the LCA continues to meet its mandate as the preferred natural and neutral ADR institution in Nigeria, as well as on the African continent. Is the LCA a Government institution? The LCA is a private sector owned and operated institution, independent of regulation, direction or control of any branch of government. It was established under the LCA Law No. 17 of 2009, which was made pursuant to the Lagos State Arbitration Law, No. 18 of 2009, as an independent dispute resolution institution. Are the Services of the LCA limited to Lagos and Nigeria? The services of the LCA are not limited to Lagos and Nigeria alone. The adoption of “Lagos” in the LCA’s name simply symbolises where the headquarters is domiciled. The LCA is an International Centre for Arbitration and ADR, serving clients in Nigeria, Africa and the rest of the world. What makes the LCA a “Court”? The LCA differs from the traditional Courts which consist of the Customary Court, Magistrate Court, High Court, Court of Appeal and Supreme Court. It is not a state-owned entity, nor does it operate like a traditional. It has no affiliation or connection to any Nigerian Court. The LCA is referred to as a “Court” because pursuant to the LCA Law No. 17 of 2009, which established the LCA, it was given the power to be the final arbiter for the application of the LCA Rules 2011 (with amendments, June 2013). These Rules are modelled after the UNCITRAL Model Law on International Commercial Arbitration (as revised and adopted in 2006) (“the Model Law”). Further to its own set of Arbitration Rules and Mediation Guidelines, the LCA has an accompanying guide for the assistance of parties and neutrals. 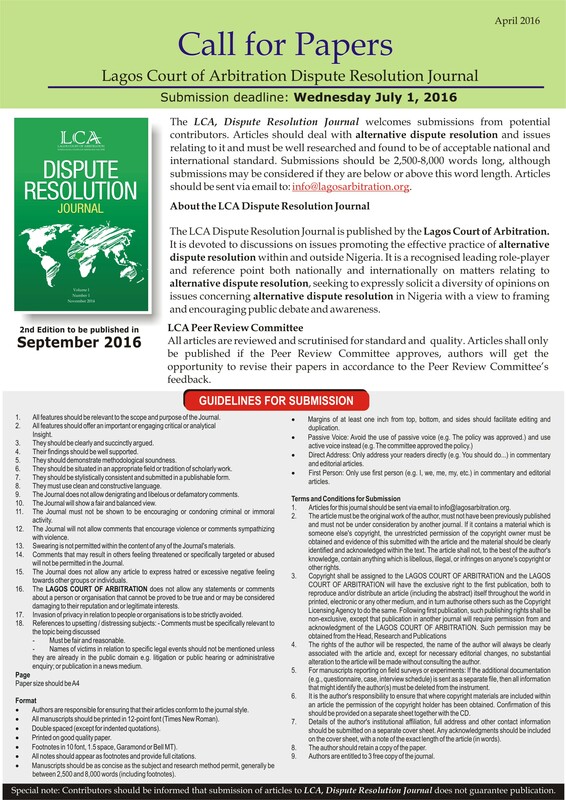 How does the Nigerian Judiciary support the LCA and the arbitral process? The Judiciary recognises arbitration as a ‘necessary adjunct’ of the entire legal system. It supports the LCA and arbitral processes in a number of ways. These include— recommending arbitration or other forms of ADR when litigation is sought in the first instance; issuing subpoenas, granting injunctions, interpreting and enforcing arbitration agreements, recognising and enforcing interim measures during an arbitral process, and finally, enforcing arbitral awards. How is the LCA funded? The LCA is presently funded by grants, income from dispute resolution services and membership fees. It also generates fund from the hire of meeting and hearing rooms and the letting of office spaces at the ICAA. The ICAA was purposefully set up to enable the LCA become fully independent and self-sustainable –thus, reducing the dependency on grants/donor funding. Tenants of the ICAA include; the Chartered Institute of Arbitrators (UK) Nigeria Branch, the Chartered Institute of Arbitrators Nigeria, the Lagos Chamber of Commerce International Arbitration Centre (LACIAC), and the Maritime Arbitrators Association Nigeria (MAAN). In addition, the Investment Climate Facility for Africa (ICF) awarded a grant to assist the LCA become fully operational by supporting capacity-building, knowledge-sharing initiatives for stakeholders, and communications campaign. Likewise, in a proactive step to promote Lagos State as an attractive seat for disputes settlement, the Lagos State Government donated the ICAA architecture (residence of the LCA) as well as a start-off grant, necessary to position Lagos as a hub for arbitration and alternative dispute resolution (ADR) in West Africa. Has the LCA partnered with any other established Arbitration centres? The LCA enjoys supportive business relationships with individuals and organisations renowned for their excellent pedigrees in arbitration and ADR. These include the International Chamber of Commerce (ICC), the International Bar Association (IBA), the Mauritius International Arbitration Centre (MIAC) and the Kigali International Arbitration Centre (KIAC). Why are there so many new Arbitration centres on the African continent? Indeed, the emergence of arbitration centres on the African continent is largely due to the emergence of Africa as a destination for trade and commerce. This was made possible by the growing rate of political and economic stability in Africa and the existing rich deposit of natural resources and human capital. As a result, these centres are able to resolve commercial disputes originating within and outside the continent. With these indices, positive prospects await businesses on the continent, especially in Lagos, Nigeria—West Africa’s financial capital and Africa’s ‘Big Apple’. What is the LCA’s jurisdiction? The LCA is an International institution for the resolution of domestic and transnational commercial disputes, and provides a forum for dispute resolution proceedings for all parties, irrespective of their location or system of law. What cases can the LCA not administer? The LCA only administers commercial disputes. Therefore, any matter outside the ambit of commercial dispute is not within its jurisdiction. Can the LCA appoint in ad-hoc arbitration? Yes, the LCA Rules and Guidelines accommodate both ad-hoc and institutional arbitration.